Light Up The Lake returns to its rightful spot in 2018. Just before the stress of finals begins every year since 2008, Ohio Staters puts on an event that has become one of Ohio State’s most beloved traditions: Light Up The Lake. Break into the holiday season by attending this night filled with holiday music, close friends, and a beautiful backdrop of twinkling lights. Grab a cup of hot chocolate and maybe a couple Insomnia cookies before finding your seat in Ohio State’s 92-year-old outdoor amphitheatre (which became a fully functional stage with concrete and electric capabilities in 1985. Thanks, Ohio Staters!). I sat down with Sam Koziol, one of the Ohio Staters in charge of Light Up The Lake to talk about the big night. This year’s set list will feature many of the performers who have been involved the past, as well as a newcomer. Students might even be visited by some of the university’s finest. Koziol said bringing the community together and the camaraderie that it brings is one of his favorite parts of LUTL. It also helps that he finds the winter season to be the best time of the year. With the construction of Mirror Lake taking place since the start of 2016, LUTL has temporarily been known as LUNA, or Light Up the North Area. The past two holiday seasons’ performances took place on north campus around the North Recreation Center. While the spot was a nice size for a stage, an audience, and a long run of lights, it could never replace where the magic all began. It’s more difficult, but the hanging of the lights is the marquee moment of the night. Koziol is sure the atmosphere that it will create will more than help cover up the lack of trees compared to years past. The event is no small feat either. As the campus population size continues to expand, so does Ohio Staters’ plans for LUTL. Koziol said they stick to the motto of “one light per student” so that comes out to roughly 60,000 lights to represent everyone. 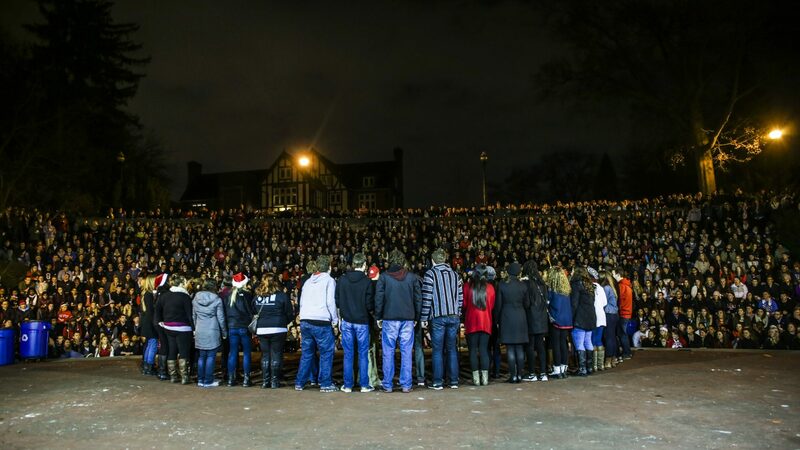 This idea of all the lights representing all the students wasn’t conjured out of thin air, rather it goes back to the Ohio Stater’s core beliefs when it comes to helping out around campus. Celebrate the return of Light Up The Lake on Dec. 5 at 6 p.m. at Mirror Lake. Feature photo provided by Ohio Staters.